The Ankylos® SynCone®, (Dentsply Friadent GmbH, Mannheim, Germany) offers the option of an immediately functional overdenture, chairside, while the patient is still anesthetized. The patient leaves the office with a fully functional esthetically pleasing prosthesis. Dr.Turner and his team have mastered the art of placing implants in their patients with SynCone abutments and have delivered immediate implant supported overdentures for over 100 patients with the SynCone technique. Please visit the link to read more. Dentslpy Friadent (Germany) has introduced a novel method called as SynCone, wherein 4 implants are inserted in the mouth and the patients existing denture is immedialetly fixed onto these implants for a fixed stable frictionlock connection using SynCone abutments. The patient walks out of our dental office with a new smile and renewed confidence on that very same day. 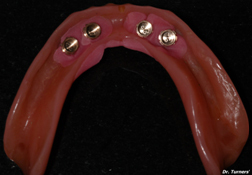 Denture with SynCone Gold Caps to fit exactly on top of the SynCone Abutments. With the application of this advanced SynCone concept at Dr.Turners’ Speciality Dental Center, patient gets the Implant-supported Overdenture immediately on the same day!! !